We climbed this route on Canadian Thanksgiving weekend. The mountains had fresh snow, so the route was more of a mixed snow/ice/rock climb. We ascended the East Ridge of Matier, and descended the Anniversary Glacier. The above photo of Mt. 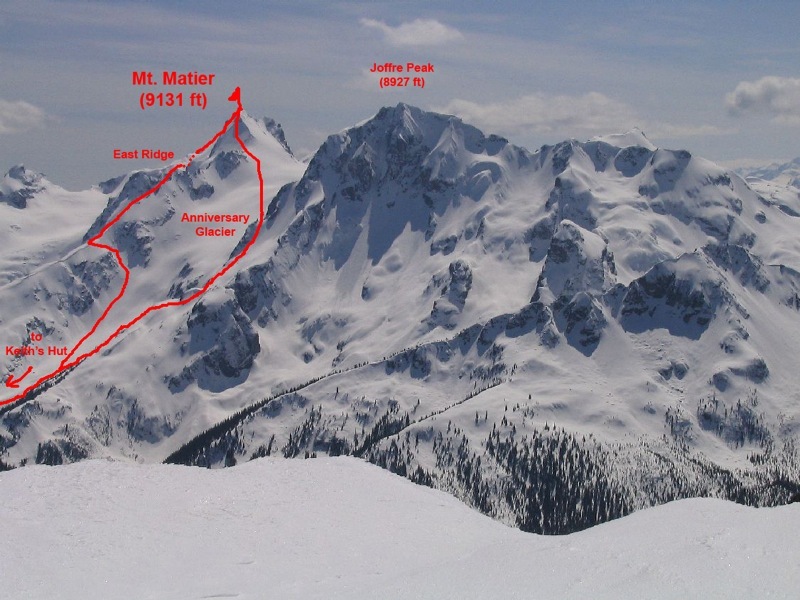 Matier (9131ft) and Joffre Peak (8927 ft) was taken from Mt. Rohr, found on this page. The amount of snow in the photo (taken in May 2006) actually looks similar to the amount of snow we had when we climbed the East Ridge in October. On Thanksgiving weekend (Canada), I headed up to the Joffre range (part of the BC Coastal Range) with two guys I had met through a friend of mine. After a summer of rock climbing, I was excited to do some mixed climbing, as well as meet two alpine climbers from the area (since I’ve had trouble finding alpine climbers near where I live). We had discussed three routes: the Central Couloir and Twisting Couloir on Joffre (both ice/mixed; D-/AD+, 4th/low 5th) and the East RIdge of Matier (AD, low 5th, 3400ft). The weather report called for precipitation, with freezing levels being low on Saturday and Monday, but a chance of warming and heavy rain on Sunday. Not the best of forecasts, but we headed up anyway. We arrived at the Cercie Creek Trailhead at midnight on Friday night. We began hiking and reached Keith’s Hut 2 hours later (4km, 1800ft). Around 3am, when we had our wet gear laid out to dry and a fire burning in the hut’s stove, we briefly debated the merits of sleeping or staying awake, then set our alarms for 7am, and went to sleep. It wasn’t long before we were eating breakfast and watching the snow fall outside of the cozy hut. Given the weather and unknown snow conditions, we decided to head up the East Ridge of Matier, the least technical of the three routes we wanted to do. The page below gives photos from our fun and snowy wallow up the East Ridge of Matier. This was the only climb we ended up doing, since heavy rain Sunday, combined with the threat of rising freezing levels Monday and high avalanche conditions, encouraged us to hike out early. But my experience on Matier with Jon and John-Mark has convinced me that climbing nee not end when the summer ends! And, I’ve found two awesome new partners to climb with! Wallowing through deep snow on the lee side of the moraine not far from Keith’s Hut. Looks like an early ski season this year! The avalanche conditions were actually pretty high – there was about a 1ft-thick layer of snow that easily sloughed off some softer snow below. Ascending the Anniversary Glacier. Ascending the couloir we used to gain the East Ridge from the Anniversary Glacier. Ascending the snowy East RIdge. Ascending the snowy East Ridge. There was a short (about 50ft) low 5th Class section midway through the climb. We had traversed around on the south side of the ridge, and had to climb up some snowy rock to regain the ridge crest. Wish there was more of this stuff! Ascending the snowy East Ridge. Ascending the East Ridge. We headed up the couloir on the right. There is a nice sheltered cave near the top of this couloir. Ascending the East Ridge. For some reason, this is one of the only photos I got of John-Mark (rest are of Jon). Sorry John-Mark! Jon in a cave where we took a break, about 1.5 hours from the summit. Steph and John-Mark on the summit of Matier. Not really the beautiful 360° panoramic view we were hoping for! DESCENT: My camera was fogging up pretty badly and visibility was bad too, so I didn’t get any good photos of the descent. Basically, we descended from the summit to the Joffre-Matier Col, and from there descended the Anniversary Glacier to the moraine on the skier’s left. (We were careful to watch out for crevasses buried by a thin layer of unconsolidated new snow; even so, occasionally one of us would find ourselves buried to the hip with one foot in a crack.) We crossed over the moraine and soon after we were back at Keith’s Hut. There is a nice hut called Keith’s Hut about 4km and 550m (1800ft) from the road. We arrived at the parking lot at midnight Friday night, and hiked 2 hours to the hut. We were the only people staying there Friday night, but there were about a dozen people there on Saturday night, celebrating Thanksgiving weekend in style (when we opened the door, we were treated to the smells of grilled chicken, cranberry sauce, and pumpkin pie – we arrived just in time for some leftovers!). The hut is free (suggested donation) and has an ample supply of firewood (flown in by a helicopter). We were certainly grateful for the cozy hut in the wet weather! Keith’s Hut. Inside Keith’s Hut. A nice sleeping loft upstairs. We were the only ones there Friday night, but there were over a dozen people there Saturday night. Cozy fire in the wood burning stove in the hut. There is ample flirewood flown in via helicopter.